Our Dentistry programme in Peru is based in the World-Heritage city of Cusco, the ancient capital of the Incan Empire. You will be placed in one of the public health centres that have dental clinics attached to them. You will be volunteering in dentistry in a developing country so you will find equipment won’t be as modern as you are used to. Your role will be mainly observational. You will shadow dentists and other dental staff throughout their day. You will see routine dental work including extractions, fillings and caps as well as preventative dentistry. Depending on your qualifications and by showing initiative and enthusiasm, you may be able to support the local staff with their duties. Volunteers who become a valued member of the team and who have a pro-active approach will get a great deal out of the programme. Volunteers on the dentistry placements usually work from Monday to Friday and have the weekends free. Your hours are usually 8am to 1pm, although there may be other work available in the afternoons. Previous volunteers have also got involved in activities such as running dental health workshops in the local community. 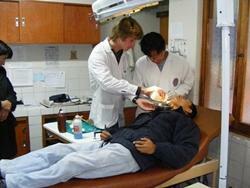 For all Dentistry placements in Peru, you need at least intermediate Spanish. You must be able to commit to a minimum of four weeks on the project. During your time in Peru, you will stay with one of our local host families. Here you will have the opportunity to experience the warm hospitality of the Peruvian people. You will also be able to practise your Spanish speaking skills. During your time off you can explore the delights of Cusco and the surrounding region with our volunteer community.